Database Version 10.0.2 Update now Over 150000 Individuals. More of everything!! Join the ever growing list of researchers & subscribers from around the world. This resource has proved very popular with many subscribers. It contains a vast amount of data that has been researched and accumulated resulting in an extremely large database, which continues to grow. The automated database can & is updated in "Real Time" as and when required. 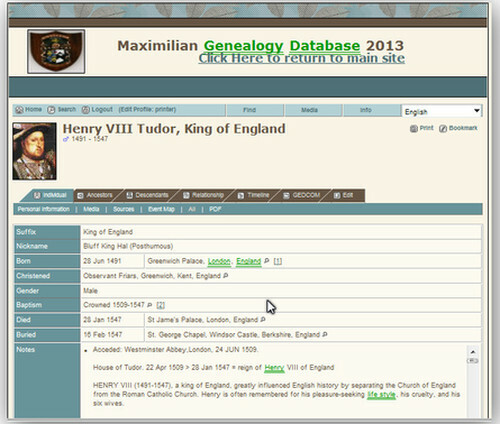 All the images have been included from the original databases. You can still get access for the same low one off price. Subscribe now before prices are reviewed. 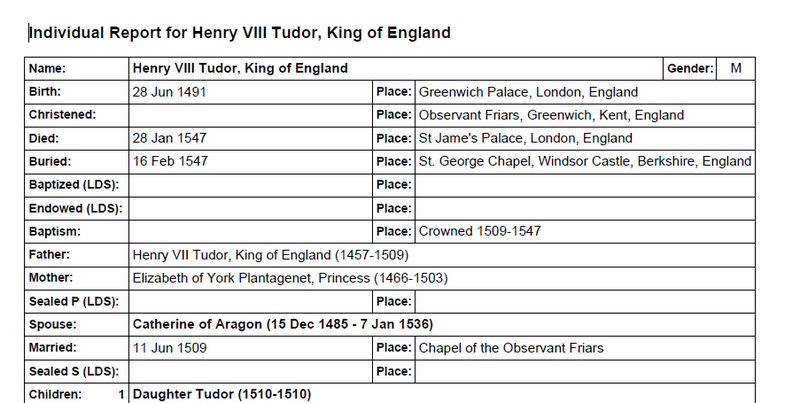 There are numerous famous people from history, from all over the world, as well as most if not all of the Royal Houses. Everyone is linked. Search facility as well as comprehensive indices are also provided.The automated version has additional search capabilities as well as Pedigree Charts, Drop Down Descendants lists and report options. These are just a few of the highlights you will find: William Shakespeare, Cleopatra of the Nile - Julius Caesar - Claudius - Pharaohs – Arnold Schwarzenegger (& other film stars) – Jane Austen – Florence Nightingale – Lord Byron – Many US Presidents - Walt Elias Disney - Thomas Alva Edison - Humphrey DeForest Bogart - Many British Prime Ministers.Recently added: my family link with Buffalo Bill (William F Cody), Pedigree of Robert Edward Lee (General of the Confederate Army) to name but a few of the major highlights. To either register for your Free Trial or subscribe now with a one off payment for your lifetime membership, please use the links "Register for a Free Trial" or "Register for a User Account". If you are already a member, welcome back; you can login by selecting "Subscriber Login". The Free Trial entitles you to 7 days access to over 150000 linked people Google Maps included Language updates and loads more. Towards the end of your trial we will send you a Paypal invoice to your registered email address (so please ensure this is correct) which you can select to pay or reject. We do not take any bank or card details. We feel sure you will wish to take advantage of the low one off payment and join our ever growing list of subscribers. Once you have a paid up account you will have unlimited access to the database and all its features, including the ability to download gedcoms, search extensively, create varied reports eg "Individuals whose birth locations have been found & entered." "People born in Wales ", "Those with the title Lady ", "Kings & Queens of UK & Europe" and so on. There is also the ability to create PDF Reports similar to the one shown here.